So how does one get started on the path to Flow? Is there one starting point for all? Are there multiple starting points? What influences your starting point? Why do adults start working out, or start to train for an event, say a road race or a triathlon? Why do adults buy a gym membership intent on joining in on spin classes or working with a trainer? Why do adults join teams such as basketball or hockey or a tennis or squash league? Why do adults typically start anything as adults? Worried about their health, worried about their fitness, worried about their weight, worried about missing out on being able to participate in an event that family or friends are ‘into’ doing, worried about their image, worried about their attractiveness, worried about… well… you name it. 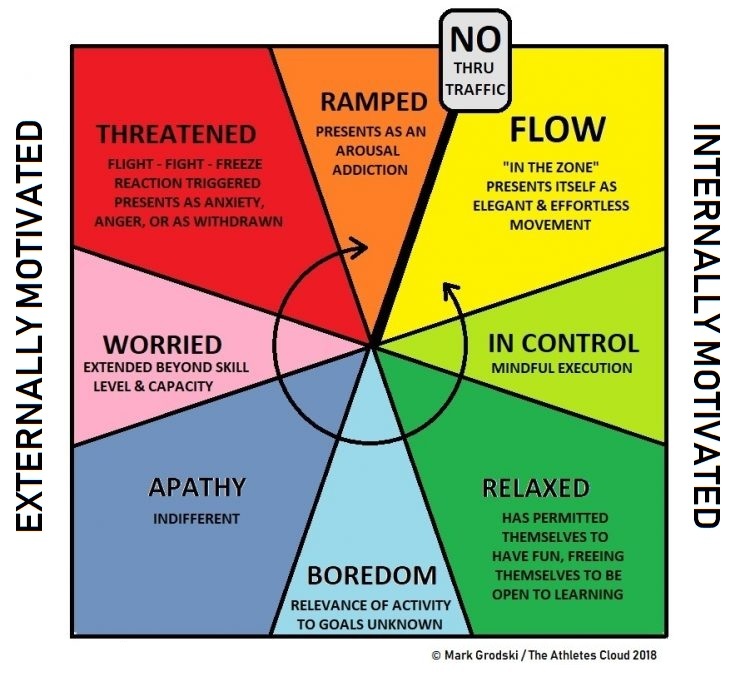 Worried, anxious, concerned, uneasy… whatever… the point is that adults rarely (if ever) start something simply because they were sitting around wondering what to do with their time and instead are motivated externally by a trigger that causes them to act. What are possible trigger events? An annual check up with your doctor when you hear… your risk for an heart attack, a stroke, cancer or some other dreaded disease. A family member, a friend, or a coworker develops a disease, especially one that no one saw coming, especially one that no one would have bet they would ever be diagnosed with because they… work out, are fit, run marathons, etc… or because they are thin, they ‘looked’ fit or healthy. Simply standing on the scale one day and it hits a number that you swear must be a mistake. Shopping for clothes and realize the size you need is a size you never imagined you would need. Sign up for a run, a triathlon, or a grandfondo only to DNF [Did Not Finish] because of underestimating the event and/or overestimating their level of health, fitness, and function, or both. Whatever it is, adults are typically only willing to alter their lifestyle when the threat level of no longer doing something is unacceptable, when the threat level has built up to the point they have to [do something], or else suffer the consequences which are now a clear and present danger to their health, their well-being, their quality of life or perhaps even to life itself. Otherwise, adults wait and wait and wait, deny and delay until… they are diagnosed with a disease, they are hospitalized, they suffer an emergency, an accident, they wait until life hits them hard, until life brings them to a dead stop, and even then some adults will still not do what needs to be done because playing the part of victim has become the habit, their lifestyle is built around being a victim. 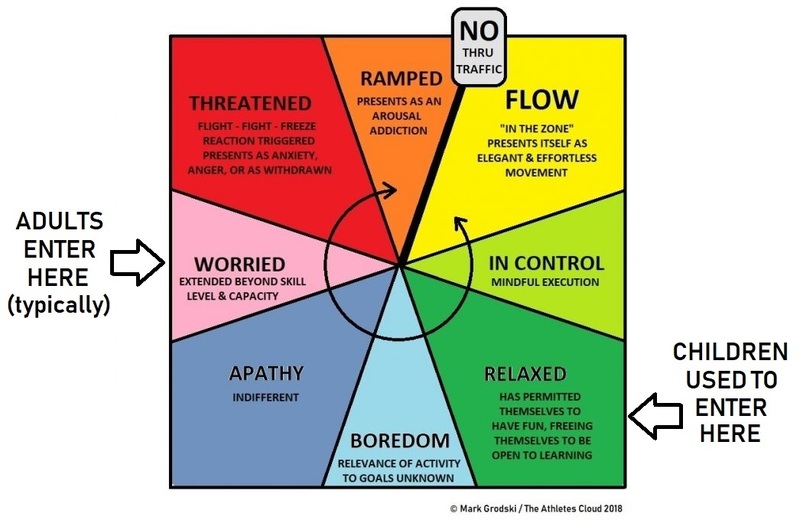 As a result, adults – typically – enter the Flow pinwheel at ‘Worry’ but there are some that enter only when ‘Threatened’ because they literally have to be threatened with death or other dire consequences. The problem with entering at ‘Worry’ [or ‘Threatened’] is that the motivation to add going to the gym, working out, starting to play a sport, or training to compete in an event arises not from joy, enthusiasm, excitement, or any other relaxed positive state of mind or being, it arises as a response to danger. Therefore, the journey towards whatever goal is set can only be pursued as long as the initial starting point of the threat of danger is maintained. How do we continue to maintain a state of !DANGER! ?? Since the initial trigger was external, we depend on external triggers to maintain our ‘motivation’: we have to continue to worry and/or threaten ourselves with the consequences of not doing what we need to do. This strategy works, until it doesn’t and when it doesn’t then finding the motivation to keep going dissipates and we are back to square one… having ‘failed’ to get healthy, to lose weight, to get fit, strong, flexible, dynamic and this is the start of the hokey-pokey… on a diet, off a diet, at the gym, not at the gym, signed up for a bootcamp, quit the bootcamp, training, not this week, and so on. The problem with all external motivations is that our body and brain (as in our physiology and psychology : narratives/mindsets/attitude) get accustomed to them, so as much as they were a motivator at the outset, external motivators or triggers have to continue to be built bigger and bigger in order to continue to have the same effect. Its like alcohol… first 1 drink is enough to get you drunk, then your body normalizes and becomes accustomed to 1 drink, so you need 2 drinks, then 3 drinks, then the entire bottle, eventually its an entire evening of drinking that is needed in order that you hit the same level of drunk. Its the same reason we can put on 80lbs and ‘not realize it’. We put on 5lbs and after a few weeks, its normal to us, then another 5lbs, then another 10, then 20, then 40… “all of a sudden” (as if… but thats the way it feels) we are 80lbs overweight and we wonder how that ‘just happened’. This is why sport has become overwhelmed with thrill-seekers… its individuals who used the ‘threat’ of an epic event to get them going on whatever goal in order to deal with some ‘worry’ in their life. Like getting drunk… the epic event to start may have been a 5k run, but then to continue to be ‘motivated’ to train you have to scare yourself by signing up for a 1/2 marathon, then a full marathon, then a triathlon… and you can’t even swim… but signing up will ‘force’ you to learn how to swim… right? Better yet, sign up for a 70.3 Ironman or full Ironman triathlon just to ensure that you are scared stiff daily of the thought of the start line… and this is what we think is healthy motivation, which we think leads to health training and competing, and we think that this approach will help us solve the ‘worry’ that got us started on this path. However we do it the intention is identical… to build in us a level of anguish, anxiety, or anger that will serve to ‘motivate’ us to keep going towards our goal. When the strength of the triggers diminish, we find a new way of ramping up the anguish, anxiety, or anger level to jolt us back into action. Can you now appreciate why at HiiT (hi intensity training), bootcamps, spin classes or in CrossFit the instructor or trainer is screaming at the top of their lungs to ‘motivate’ you to go harder, and harder, why the music is set to bone-rattling, why instructors or trainers who write up the workouts guaranteed to make you spit blood are considered ‘the best’… why of course, these are all tactics to try to scare the stuff out of you… obviously… because this is what gets you healthy! Re-read the last paragraph and stop and think about it… the insanity of it all should hit you squarely in the head. We expect threat and intimidation to motivate us into achieving health? And we wonder why kids are opting out of competitive sport, and sport in general? And we wonder why the World Health Organization states that by 2020 anxiety and depression will be the top medical diagnoses? Yeah… we need marijuana to be legalized… don’t think so because we are already smoking some serious s#!t if we think that provoking ourselves into states of anxiety, anger, worry, being highly threatened, intimidated and ramped somehow yields health and wellness and the goals we truly want to achieve. It should be no surprise whatsoever now as to why… most diets fail, most weight loss goals end in failure, why most training plans fail, why there is a 10-25% DNS [did not start] rate at triathlons, why there is an almost equal DNF [did not finish] rate at long distance triathlons, why gyms have limited square footage but can sell an unlimited number of memberships : because any goal with a starting point of worry and/or threat as the motivating trigger is destined to fail. There is nothing ‘wrong’ with you, you do not lack will-power… when the motivation is wrong, the goal becomes impossible. Actually its worse than that because when action plans ‘motivated’ by worry/threat are stopped there are serious side-effects… the strategy of scaring yourself stupid triggers a long line of consequences that in the short term seem to pay off as weight loss, and as gains in ‘fitness’. In the long term maintaining a semi-permanent state of fear, anguish, anxiety, or anger leads to even greater erosion in health and well-being across all our dimensions: physical, mental and emotional. This is why when you stop pursuing a goal which is motivated by worry/threat you actually put on a pile of weight, its why the strength, the endurance, all the ‘fitness’ gains you made disappear within days or a week at most. Its worse because in the end you end up further away from your goals then when you started. To make matters worse, the entire sports, fitness and health industries have figured out that threatening us (indirectly of course) is the ticket to selling just about anything and everything. Figure out how to get someone worried about their health, their wellness, about disease, longevity, illness, injury, etc… and you can ‘sell’ them just about anything and not only will you sell it once, they will come back and buy again and again as long as they believe that their worry is being ‘solved’ by whatever it is they are buying. Industry is working desperately to convince y’all that gym memberships, smoothees, supplements, protein powder, a keto diet, a paleo diet, HiiT (Hi Intensity Interval Training), bootcamps, spin classes, yoga, hot yoga, this fitness apparel and those fitness trackers and these fitness apps are all key to health, wellness, disease, illness and injury prevention. Meanwhile everyone fails to stop and see that despite all the ‘solutions’ we are all getting fatter and fatter to the point that more of us are now overweight and obese than those who are normal weight. Average now means to be unhealthy… think about that. Meanwhile, if you go back a few decades where there were none of the above ‘solutions’ and we had nowhere close to the level of disease raging throughout the population. Where did children enter the Flow pinwheel back in the day, and where do children enter the pinwheel now that they are raised by tablets, smartphones, game stations, the internet and social media.